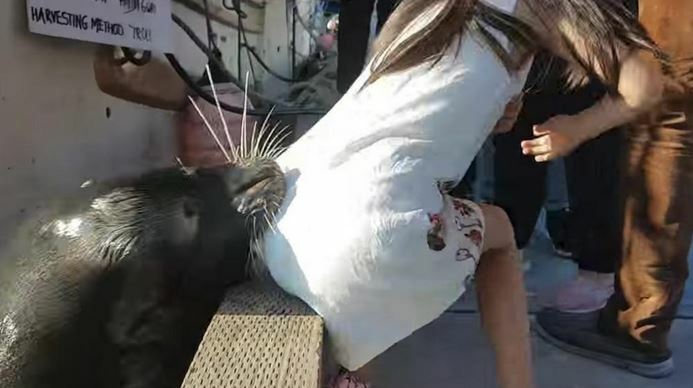 The viral video of a young girl snatched off a Richmond, British Columbia dock by a sea lion is another reminder that people shouldn’t get too close to wild animals. Port officials in Canada have sharply criticized the family for putting themselves at risk for feeding the large animal, especially since there are several signs in the area warning people not to do so. “You wouldn’t go up to a grizzly bear in the bush and hand him a ham sandwich, so you shouldn’t be handing a thousand-pound wild mammal in the water slices of bread,” Robert Kiesman, chair of the Steveston Harbour Authority, told CBC News. I thought the same thing when I saw the viral video. If you were not aware of the whole story before, now you are. And what were they thinking sticking their hand out to it? Did they think it was going to side up and let them pet it? I mean, seriously!